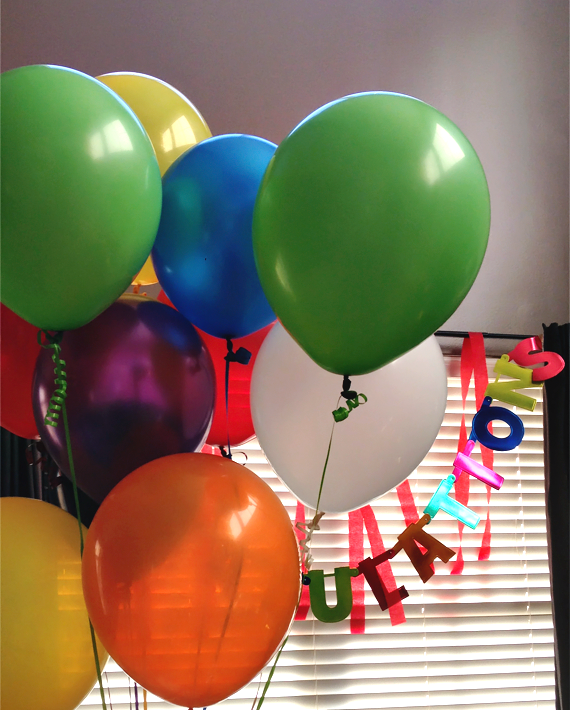 This past Sunday, my husband and I got up at 3:30 AM. We ate oatmeal. He jumped in the shower and put on his running gear. 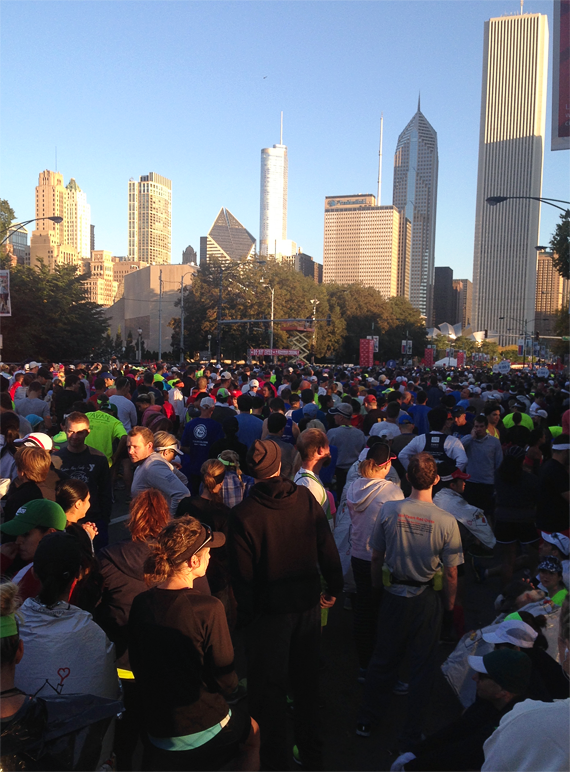 He then hopped on the train, still in the pitch black of night, and headed down to Grant Park to run 26.2 miles alongside 45,000 runners from all over the world. I told you guys about his plans to run the Chicago Marathon back in July, but I don't think I had any idea until it actually happened just how emotional it would be. 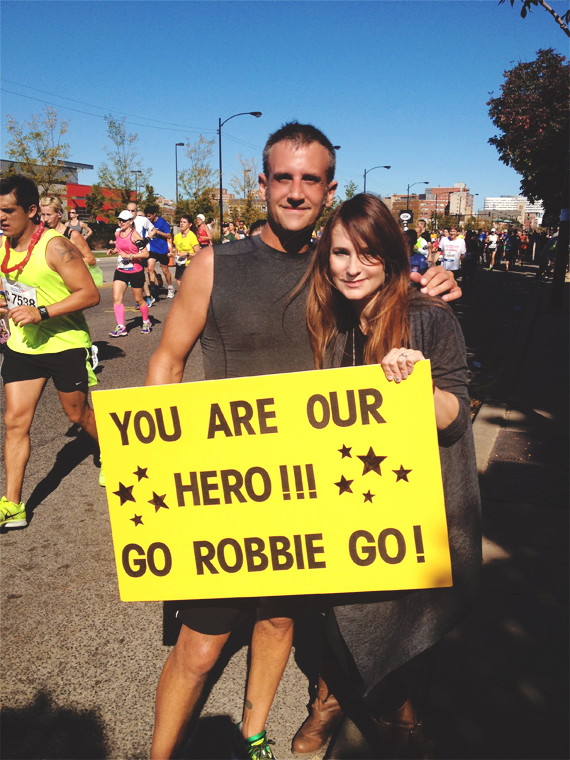 I knew I'd be proud of Robbie - I mean, the dude quit smoking in February, started running in May, and ran a freaking marathon in October. He also made the decision not just to run, but to run to raise money for the Chicago Diabetes Project (and he raised almost $2,500). How could I not be proud? 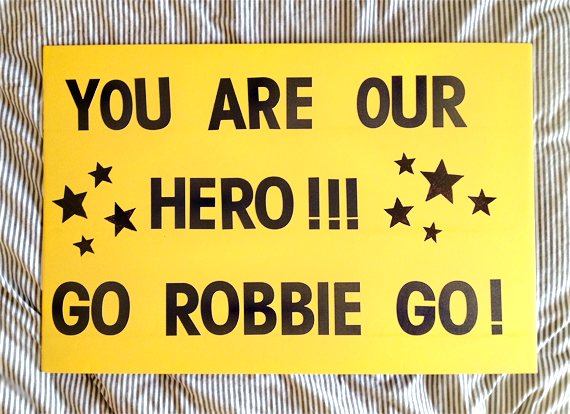 But standing there on the sidelines with so many others (1.7 million to be exact) holding inspiring signs and cheering, watching thousands of people run, each with their own story, and then suddenly seeing Robbie in the crowd, working SO hard - I just lost it. It was impossible to hold back tears. When we first caught up with him at mile 13.5 and he ran up to me, all sweat-covered and smiling, and kissed my belly to let our daughter know happy he was to see us, I felt completely overcome. It might sound silly, but it was such a magical moment. Later, we met up again at mile 18.5, and he was starting to look tired (although looking at the picture at the top of this post, where it was taken, I think I looked more run-down than he did!). I was a little worried, but he wasn't. I handed him a change of socks and he said felt renewed. He gave us hugs, posed for a quick picture, and off he ran again. And although he started experiencing some cramping at mile 21, he kept going. He ended up with an official finish time of 4:35, and placed in the top half of all runners. 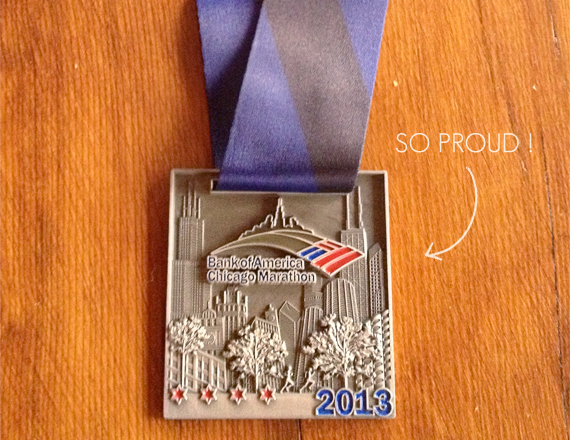 Not bad for someone running their first marathon (and someone who didn't even run at all before May of this year!). It was a lot harder than I'd anticipated to get around the city by car with all of the road closures and lack of parking, so my big plans to see him at least once an hour didn't happen. But getting to meet up with him twice during the race and once at the end was enough. It was the perfect amount to show our love and support without breaking his concentration. After the race, my mom and I headed over to our friend Alex's where a few of us gathered and waited for Robbie. When he walked in, medal around his neck, I think we all got a little choked up. We ordered lots of food and listened to his stories from the race, and then headed home, where I'd decorated the house for him in the wee hours of the morning after he left. There we ate some more (he burned off 4,000 calories running! ), and were in bed by 8 PM (a very rare occurrence for us). It was an incredible day. I'll admit that I never understood the whole marathon hype before. I consider myself to be fairly healthy (I walk, do yoga, and eat a balanced, vegetarian diet), but I've never been big into serious fitness routines. To me, marathons always seemed a little excessive, and I'll admit that I (wrongly) assumed that they were mostly about overly athletic people pushing themselves too hard. It turns out that marathons are about much, much more than physical accomplishments. They are actually just a different kind of zen. I realize now that they're about being mindful and disciplined in a very similar way to meditation. Robbie physically trained for months, but it was more about mental stamina and focus than anything else. He says that it was truly one of the most amazing experiences he's ever had. And he's already talking about next year. Thanks for letting me gush for a few minutes (proud wife over here!) and share some of the photos I snapped with my phone on race day (they're terrible quality, but I just had to share). 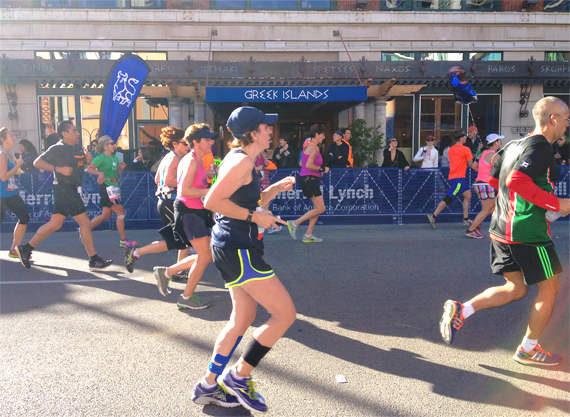 Have any of you ever experienced a marathon as a spectator? Or have any of you actually run one? I'd love to hear your stories! What an awesome medal, you must have been (and probably still are) super proud! Oh the pancarte was a sweet thing to do!!! I hope he is proud of his medal!!! Way to go Robbie...Congrats!!! What an amazing accomplishment! My boyfriend's cousin ran in the same marathon. She ran for an organization that raises money for children with cancer. You've got every right to be proud! He's an inspiration to many with all that he has accomplished this year and running for a great cause. I'm so proud to say that justByou sponsored him in this event (even if it was only a few dollars). Thank you for donating Anna! Congrats to Robbie, great job. Way to go, Robbie!!!! Thanks for sharing, Mel!! congrats to him! such an amazing feeling. 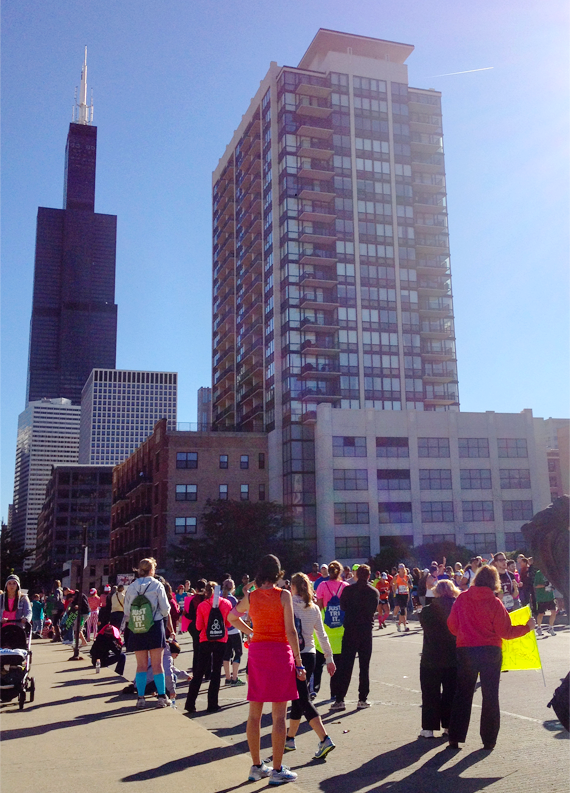 i ran Chicago last year and had the time of my life, although my body hated me afterwards. pretty impressive he just decided this summer to run! !